Hi everyone! I’m back today with two samples of MFT‘s October release. As a coffee lover, I was super excited to see the new Perk Up stamp set and Coffee Cup Die-namics. Seriously ♥ them. 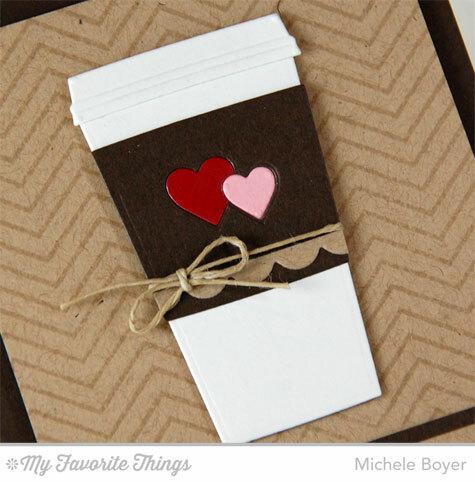 My first card used Perk Up and Coffee Cup Die-namics with new Fine Chevron Background. I used an inlaid die approach on the cup, cutting first the larger heart shape from the cup cuff, then, with the red heart in place, I die-cut the smaller heart shape. The little scalloped edge was created by die-cutting the bottom scalloped edge from one of the tags in new Tag Builder Blueprints 2. 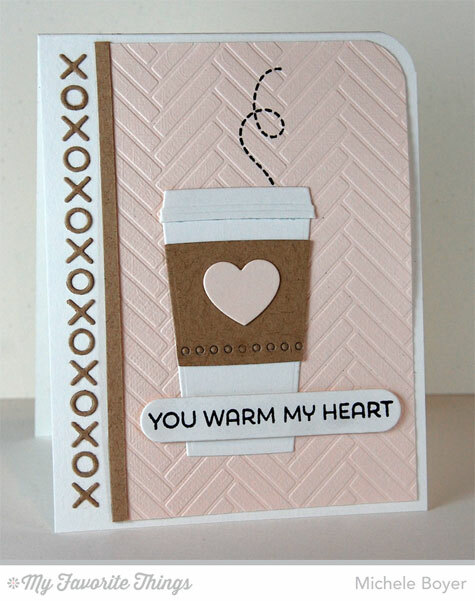 My next card uses the Herringbone Bricks Stencil to create a background and Hugs & Kisses Cover-Up to add a border. The dotted edge on the cup cuff was die-cut using an element from Blueprints 14. 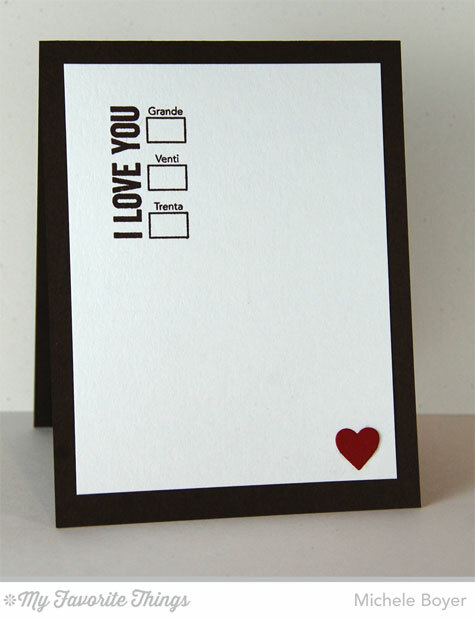 The larger heart was cut using Blueprints 15 and the sentiment was stamped onto a rounded edge Sentiment Strip. Since I had lots of x’s and o’s left from the one pass through my Vagabond, I included another row inside as well as a second sentiment from Perk Up. Be sure to check out the MFT Blog for direct links to more Countdown samples, info on prizes and all you need to know about our October 14 release! Please note that links to new products will not be in effect until time of release, Tuesday, October 14, 10 p.m. EST. Very sweet set of cards, the colors are delicate and beautiful! Great inspiration, thanks! LOVE LOVE LOVE! I have been hoping for a great new coffee set. WOW, that pink card with the XOXOXOX is so pretty. Great cards, and I really like how you did the XOXOXO. Clever!! Love the backgrounds you used to make the coffee cup the star. 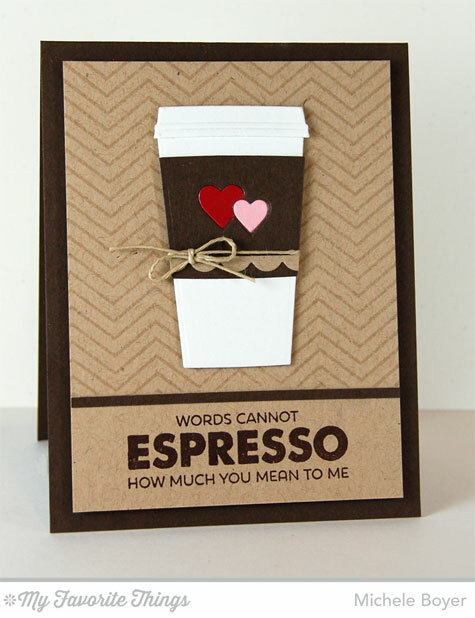 Love these caffeine inspired masterpieces! 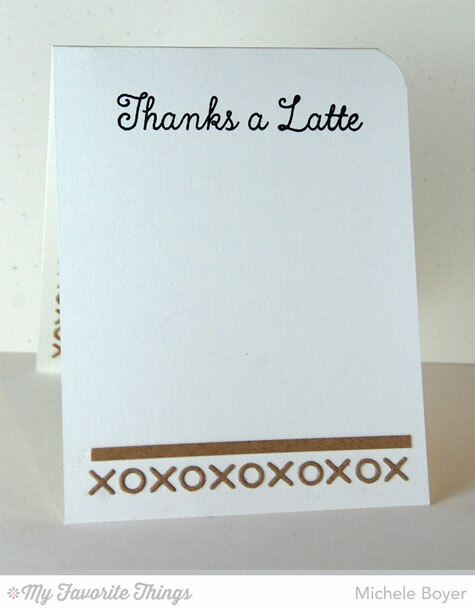 Thanks a latte for sharing! Love this set….love the pink! 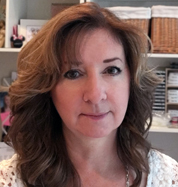 Your cards are beautiful – love the choice of colors. Very pretty cards. Thanks for sharing your wonderful ideas with us. Those are fabulous! The little inlaid hearts on the first one and all of the Xs and Os on the second one – awesome! sooooo, so fantastic times 2!! love this new set and die and the background…..oh boy it’s going to be hard to resist these. thanks for sharing. 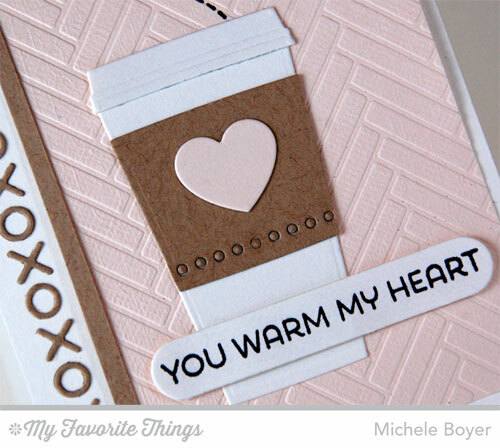 I like the Herringbone Brick background on your card and the lovely xoxo along the left edge. These things added to the already good set of Coffee Cup. Thanks for the inspiration you’ve given me. Your cards are so pretty. Love the color combos and your nice clean work is always perfect! I’m not a big Kraft color fan, but I really like how your pink & red pop on these pretty cards. Thanks for sharing! Very cute. I love the heart inlays! Thanks. Your cards are super SWEET. You have created two great cards. I really like the colors you have chosen, the double hearts and the backgrounds.